A newly formed company based in a third-floor apartment sues the city, objecting to its approval of the multi-use development that includes a shopping center with a Market Basket. A shadowy company with an address in a low-income apartment building is trying to derail a new Market Basket supermarket location that is part of an ambitious commercial complex in Westbrook on a former quarry site near the Maine Turnpike. Westbrook Property Holding, a limited liability company registered less than four months ago, has sued the city of Westbrook and the development company behind the complex in a bid to overturn municipal approval of a shopping center with a Market Basket as an anchor tenant. In a lawsuit filed in a Cumberland County court, Westbrook Property Holding accuses the city’s Planning Board of violating the city’s zoning ordinance and the company’s due-process rights. No one is certain who is behind Westbrook Property Holding. The company lists its address as a small apartment on Brown Street, about a mile from the development site. 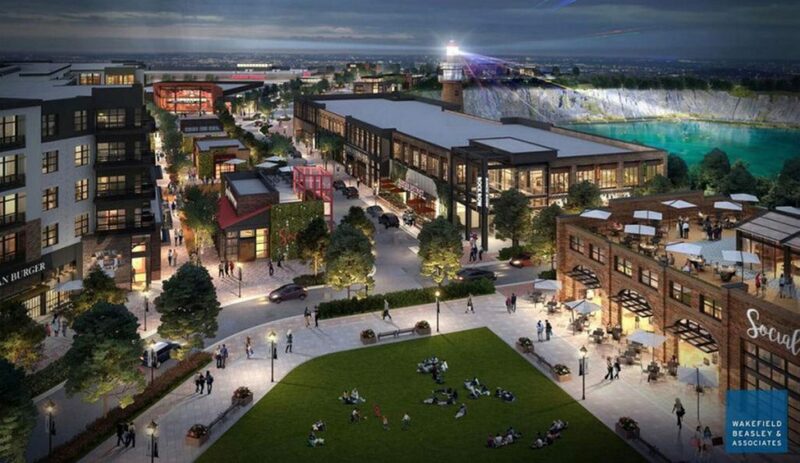 A version of the shopping plaza was approved in 2016, and the Planning Board signed off on an amended plan submitted by Massachusetts developer Waterstone Properties Group in September. The plaza is part of a multi-year development envisioned by Waterstone that includes shopping, entertainment, up to 750 apartments and outdoor recreation. 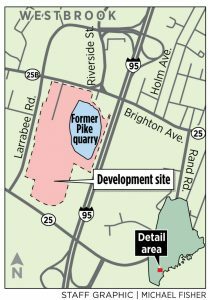 The property is a former Pike Industries quarry bordered by Main Street and Larrabee Road. Despite the scale of the project, there have been few public concerns and considerable support from city officials. The arrival of the state’s second Market Basket, the Massachusetts-based, low-cost supermarket chain, generated a lot of buzz when it was announced just over a year ago. So it was a surprise when an attorney made a last-minute objection to the project just as the Planning Board was preparing to give final approval. Michael Vaillancourt, who represents Westbrook Property Holding, told the Planning Board in September that it should not approve Waterstone’s plan because grocery stores are not a specific use allowed in the city’s “gateway zone,” which includes most of Waterstone’s proposed complex. Vaillancourt also submitted a five-page report from engineering firm Gorrill Palmer that raises the grocery store issue along with more than a dozen other complaints about the city’s review of the project site plan. Westbrook Property Holding was registered in Maine on Sept. 14, only four days before the Planning Board meeting. Vaillancourt did not respond to multiple interview requests. In the court complaint, Westbrook Property Holding argued that the Planning Board’s decision is contrary to the city’s zoning ordinance and claimed its due-process rights were violated. It asked the court to overturn the board’s decision. Westbrook and Waterstone Properties, under its Maine business Dirigo Center Developers, responded by asking the court to dismiss the case, questioning Westbrook Property Holding’s due-process claims and its standing to bring a lawsuit. Westbrook Property Holding claims it can bring its case because it is a leaseholder in 25-23 Brown St., No. 303, a small apartment on the third floor of a multi-unit building. No one answered Monday when a reporter knocked on the door marked by a brightly colored welcome mat. Landlord Bernard Willimann said Vaillancourt signed a year-long lease for the furnished apartment. He’s never met the tenant, but Willimann is certain someone lives in the unit. Rent for the one-bedroom is about $950 a month, he said. Nearby supermarkets that could see a Market Basket as a potential competitor say they are not involved in the case. “It’s not us,” said Hannaford Supermarkets spokesman Eric Blom. The grocery chain has a store in Westbrook about 2 miles from the new Market Basket. Shaw’s Supermarkets, which has a store in a shopping center across the street from the proposed development, has no connection to Westbrook Property Holding, spokeswoman Teresa Edington said in an email. Representatives of the Maine Mall and the development companies that own the Westbrook Crossing and Pine Tree shopping centers close to the development site did not respond to interview requests Wednesday. Despite the legal challenge, Waterstone says it is moving ahead with the project. Construction crews are clearing the property in preparation for construction of the shopping plaza, expected to be completed by November 2019. On Tuesday, the Planning Board approved another phase of the complex – an 8,200-seat amphitheater and 1,200-space parking lot on the south end of the property that could host concerts currently held on the Portland waterfront. The company also has proposed leasing the road infrastructure to the Portland Metro bus service to enhance public transit and potentially access more than $16 million in tax-free bonds. Waterstone has done its best to reach out to neighbors and the community about its plans and will continue to hold public meetings and hear concerns moving forward, Levy said.